When Philippe Mestres embarked on the adventure of creating an orchestra in 1995, he had already acquired extensive experience as a “conductor” through, among other things, literature for choirs and orchestra, and conducting a harmony orchestra. After obtaining the diploma of Artistic Director, Philippe Mestres took over the direction of the Conservatoire de Marmande, after a period of five years as an Advisor for Musical Studies at the Conservatoire de Bordeaux. President and Musical Director of Les Nuits Lyriques en Marmandais since 1987, he is also the President of the International Singing Competition of Marmande and a member of the Professional Chamber of Opera Directors. A graduate of SKEMA Business School (Ecole Supérieure de Commerce de Nice Sophia-Antipolis), he began his career in the management of cultural enterprises and, in particular, at the CNIPAL where he developed a professional training centre, giving young artists access to the French and international opera scenes. 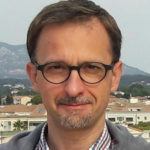 At the same time, he is involved in the associative field, where he is in charge of structuring and managing the Marseille International Opera Competition, then the Festival Musiques dans les Vignes (Haut Vaucluse). In Bordeaux, in addition to his duties as Administrative and Financial Manager of Aquitaine Culture, he works with job seekers and artists as part of the training courses given at INSTEP and collaborates with ICART where he provides lectures in “Management and Management of Cultural Enterprises” for the 4th year and the MBA. Finally, he puts his dual expertise in culture and continuing education at the service of artistic structures in New Aquitaine, particularly with the Consulting Agency and Consulting Two on a Bench. Anecdotally, but nevertheless importantly, Manuel SEBASTIAN was made last year, Chevalier des Côtes du Marmandais, whose excellence he never misses an opportunity to defend ! Graduated in higher piano class at the Conservatoire National de Région de Toulouse, she holds the CAPES in Music Education, she taught for 20 years in middle school and high school in Marmande and at the same time directs the Choeur Val de Garonne (awarded at the vocal selection of Tours in 1989) also addressing the great works of the repertoire (Requiem by Fauré, Mozart, Hymne du Couronnement de Haendel…). She currently teaches musical analysis at the Conservatoire de Marmande and directs the Ensemble Vocal Maurice Ravel within the school. Passionate about vocal art, she has also been the director of the Chœur des Nuits Lyriques de Marmande since 1991, which participates in productions. His high musical standards and the quality of his artistic work allow Les Nuits Lyriques to benefit from a first-rate choral system, which is essential to his artistic project. Jean-Marc FONTANA began his musical studies at the Conservatoire de Nice, which included a piano prize, a solfege prize, a deciphering prize, a harmony and counterpoint medal and a final diploma in chamber music. From 1981 to 1983, he was repetitive pianist in the singing class of the Conservatoire de Nice, then from 1983 to 1985, he held the same position in the vocal and dramatic workshop. He participated in the creation of Medea at the Opéra de Lyon. Singing Director at the Grand Théâtre de Bordeaux under the direction of Alain Lombard. He is also an accompanist pianist at the Placido Domingo International Singing Competition. As a Singing Conductor he has had the opportunity to work with prestigious conductors (Alain Lombard, Roberto Benzi…) and to accompany many singers in recital, staging and particular work. He also masters opera and operetta repertoires.